Zoho Sites now offers business email hosting alongside your websites. With Zoho Mail being integrated, you can now host your business website and business mail on the same domain through Zoho. Everyone. Along with your Zoho Sites account, you get to host 10 mailboxes for one domain, each 5GB in capacity, for free. For higher mail hosting limits, choose standard or premium plan of Zoho Mail. Visit Zoho Mail pricing page for information about the features available in the free plan and paid plans of Zoho Mail. 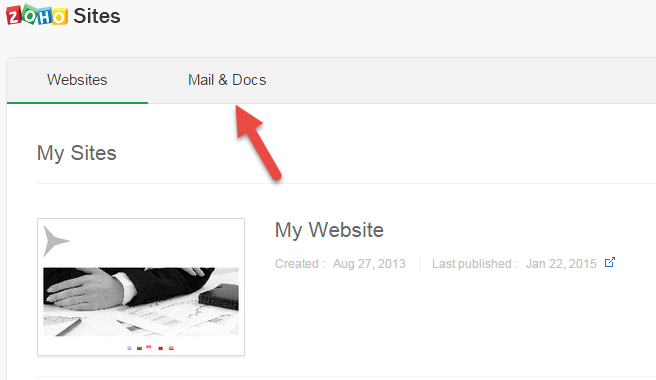 When you login to Zoho Sites, you'll see a "Mail & Docs" tab right next to "Websites". Click on it to access the domain configuration settings. That will take you to the following screen with options to get started. The primary motive is to host a business website and email on the same domain. So the first thing you need to get started with mail, is a custom domain name. There are two cases. 1. 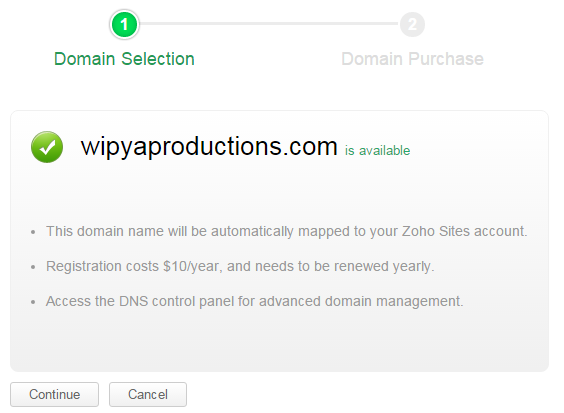 You already own a custom domain, and want to use the same on Zoho. 2. Register for a new domain name through Zoho. To register for a domain name through Zoho, access the 'Websites' tab, go to Manage > Settings > Domains, click on Add Domain, choose the option to Buy New Domain and follow the on-screen instructions. Domain names are subject to availability, so you need to check if your preferred domain name is available. Type the domain name you wish to register, and click on Continue. If it is available, you'll be forwarded to the payment screen. If that domain is already taken, then you can try other relevant domain names. For information about email hosting setup and domain verification for mail hosting through Zoho Mail, click the links given below.